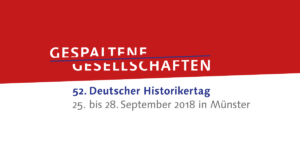 Ludwig-Maximilians-Universität München, one of the leading research universities in Europe, with a more than 500-year-long tradition, is advertising up to five research fellowships for scholars active in global history. The university is committed to the highest international standards of excellence in research and teaching. Fellows will be based at the interdisciplinary Munich Centre for Global History. During their stay, they will work on a research project in global history or its neighbouring fields. Fellows have no teaching obligation. They are expected to work on their research projects and actively engage with the scholarly community at the university and particularly at the centre. 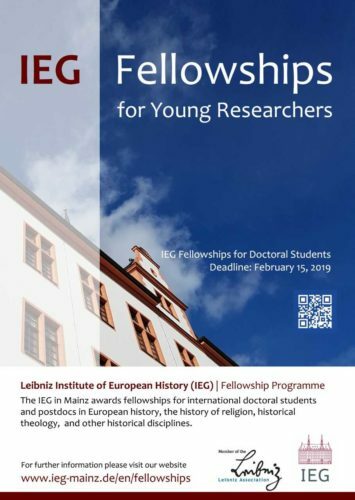 The fellowships are open to postdoctoral researchers from all disciplines. Scholars who are already advanced in their academic careers and have a strong international track record are explicitly encouraged to apply. Depending on the situation of the applicant and the character of the project, the duration of the fellowship will be between one and three months. Fellowships for the summer term 2020 should be taken up between mid-April and the end of July 2020. The fellowship entails economy travel to and from Munich, a monthly living allowance, free housing in a furnished studio apartment in Munich as well as office space at the Munich Centre for Global History. Health insurance or other social benefits are not part of the fellowship and the responsibility of the fellow. Applications will include a letter of motivation, a short outline of the research to be done during the fellowship (1-2 pages) and a CV. Please also include information as to the preferred time and duration of the fellowship. All application material should be send electronically as one PDF-file to Dr Susanne Hohler (susanne.hohler@lmu.de) until 31 May 2019. Enquiries should also be directed to Dr Hohler or to the centre’s founding director Professor Roland Wenzlhuemer (roland.wenzlhuemer@lmu.de). More information on the Munich Centre for Global History can be found at www.globalhist.geschichte.uni-muenchen.de. In the memory of 1919, the signing of the peace treaties and the foundation of the League of Nations figure prominently. The year also saw the birth of the Third International and ushered in a turbulent post-war period of revolutions and counter-revolutions, which drastically changed the international balance of power and incubated the fascist movements that in 1922 subverted the fragile democracy in Italy. As a result, the attention of scholarly and public debate focus on post-war political, diplomatic and institutional history and on Central and Eastern Europe. The conference proposes a dual shift of perspective: thematic and geographical. On the one hand, it focuses on international relief and rehabilitation programs during and in the aftermath of war. This will direct attention to international projects for political and social stabilization and the transformation processes that took place in post-war societies. It will allow us to examine the effects the war had on international relations in peacetime from a different perspective than the better-known diplomatic history. On the other hand, the conference specifically concerns the Mediterranean area thereby shifting our attention away from the well-studied Northern European and Transatlantic region. It investigates the post-war rise of humanitarianism in the countries of Southern Europe, in the colonial territories of North Africa, in the Balkans and in the Middle East. The Mediterranean saw the redrawing of the geopolitical map after the disintegration of the old empires, while at the same time a challenge to European colonialism began to rise in several places. Humanitarian projects took different forms and meanings in these contexts, but they were usually conceived as instruments that would have an impact on the long term, not simply as an immediate response to temporary crises. Research has begun to show the relevance that humanitarian affairs had for the League of Nations, which also operated in the Balkans and the Middle East. However, the League programs are only one chapter in the history of post-war relief, which saw the mobilization of national states, large and small private agencies, religious groups, societies founded on a common political ideology, experts in sectors such as medicine, public health, or education. The purpose of the conference is to study the way in which these different actors cooperated, interacted, and came into conflict, both in designing aid programs at the headquarters and in implementing them on the spot and within local communities. Specific case studies have shown that the historical development of humanitarianism came about through extensive transnational networks based on religious affiliation, on institutional relations among states, and on professional skills. With reference to the specific post-war context, the conference intends above all to highlight the way in which these networks, usually studied separately, came intersected and how the configuration in the Mediterranean area, including responses from within the societies concerned, shaped the development of humanitarianism at large. 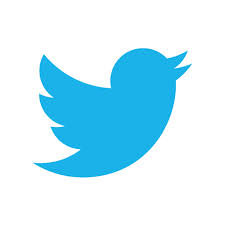 We invite proposals for papers on any of the themes, topics and areas mentioned above. The time period covered may reach from the First World War into the 1930s discussing the aftermath and effects of continued or renewed war in the regions studied. The proposal should highlight the colonial and national contexts, the contemporary ideas on political and social stabilisation and the effects of the measures taken. The conference will take place from 3 – 4 December 2019, at the University of Milan, Italy. Travel and accommodation will be covered. The publishers offers limited time 50% discount on orders placed directly via Berghahn book webpage. Use code PAU615, valid through February 28th, 2019. You can also read the Introduction. 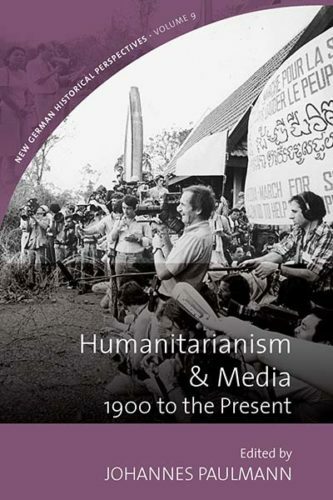 The volume Humanitarianism & Media: 1900 to the Present, ed. 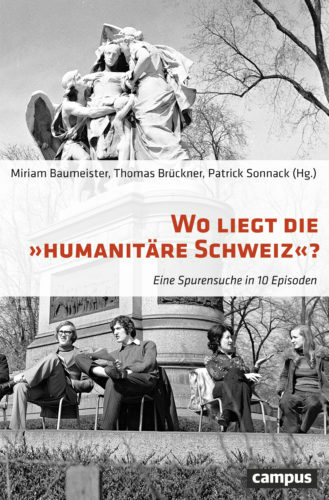 by Johannes Paulmann, traces the emergence of humanitarian imagery in the West and investigates how the meanings of suffering and aid have been constructed in a period of evolving mass communication, demonstrating the extent to which many seemingly new phenomena in fact have long historical legacies. This 2-day conference provides an opportunity to debate the ideas, developments and legacy of humanitarianism in the era of the Great War, 1912-1923. The conference sits at the intersection of two burgeoning fields of historical inquiry, the history of humanitarianism and the history of the Great War. 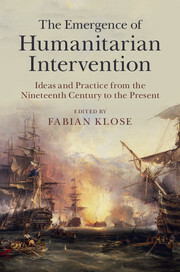 Recent years have seen an outpouring of innovative research on humanitarian individuals and organizations, fields of action, and the construction and use of ‘humanitarian narratives.’ A rapidly growing number of scholars, too, have highlighted the unique role the First World War played in fostering a ‘humanitarian awakening’ (Irwin), shaping humanitarian norms, discourses and practices. At the same time, recent scholarship on the First World War has led us to understand that conflict as a geographically and temporally much ‘Greater War’, whose critical events extended far beyond the fighting on the Western front, and 1914-18. The conference aims to bring together scholars working on a wide variety of topics and employing different methodological approaches to showcase and debate current research trends. It will discuss absences and contradictions in existing scholarship, and identify areas of particular interest for future research. Last not least, the conference seeks to encourage a dialogue between the all too often isolated historiographies on humanitarianism and the ‘Greater War’: for example, how does the study of that period’s unprecedented suffering complicate the war’s accepted chronologies and geographies? And how might new notions of the global nature of the First World War inform our approach to the history of humanitarianism? In all, the conference hopes to interrogate the significance of the era of the Great War for the emergence of modern humanitarianism, while also underlining the importance of humanitarian engagement to understanding the war and its aftermath. It is envisaged that a selection of conference papers will be published in an edited volume. The conference will be able to provide hotel accommodation to presenters. The international Global Humanitarianism | Research Academy (GHRA) offers research training to PhD candidates and early postdocs. It combines academic sessions at the Imperial and Global History Centre at the University of Exeter and the Leibniz Institute of European History in Mainz with archival sessions at the Archives of the International Committee of the Red Cross in Geneva. The Research Academy is for early career researchers who are working in the related fields of humanitarianism, international humanitarian law, peace and conflict studies, human rights covering the period from the 18th to the 20th century as well as the institutional history of the ICRC and the development of its fundamental principles. It supports scholarship on the ideas and practices of humanitarianism in the context of international, imperial and global history thus advancing our understanding of global governance in humanitarian crises of the present. 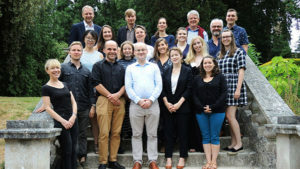 In July 2019, the Global Humanitarianism | Research Academy will first meet for one week in Mainz for academic sessions of lectures, class meetings and discussions, including study time (the academic meetings rotate annually between Mainz and Exeter; in the previous year this meeting took place in Exeter). PhD students will have the chance to sharpen the methodological and theoretical focus of their thesis through an intense exchange with peers, postdocs, and established scholars working in the same or related field of humanitarianism. The postdocs will benefit from discussing their research design and publication strategy with established scholars. This application should be compiled by the applicant and the whole set of papers including reference letters should be submitted as a single PDF, with the file saved as ‘LASTNAME_FIRSTNAME.PDF’. 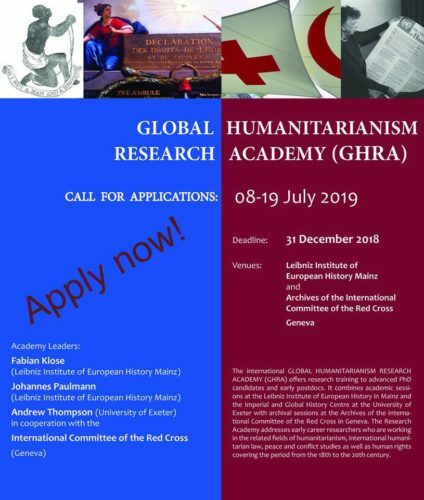 To apply, please send your application consisting of one pdf-document with the Subject “Global Humanitarianism | Research Academy” to the organisers at ghra@ieg-mainz.de by December 31, 2018. The workshop looks at the role of history and historical events for the protection of human rights in contemporary Europe that is facing an authoritarian and populist backslide. It brings together three important debates: firstly, the current challenges for the protection of human rights in Europe; secondly, the historical roots of the European Convention of Human Rights (ECHR) which was intended to provide an early warning mechanism against a fallback into authoritarianism and totalitarianism and thirdly, the way the European Court of Human Rights (ECtHR) has dealt so far in its case law with historical injustices, i.e. the type of situations it was meant to prevent from arising again. The current rise of authoritarian and populist tendencies poses the risk of turning into a severe threat for a European public order based on the ideals of human rights, the rule of lawand democracy – all of which are essential to securing peace and stability in Europe. The workshop will mapthe strengths and weaknesses of the ECHR system to keep its initial promise in the face of this current challenge. It connects three strands of discussion which have so far been leading separate lives yet need to be seen together. When thinking about the current challenges for the ECHR system it is worthwhile to reflect upon the conditions under which the Convention and its Court were set up. What was the role that the Court should play in upholding human rights, democracy and the rule of law when the Convention was drafted? How have these expectations shifted over time? 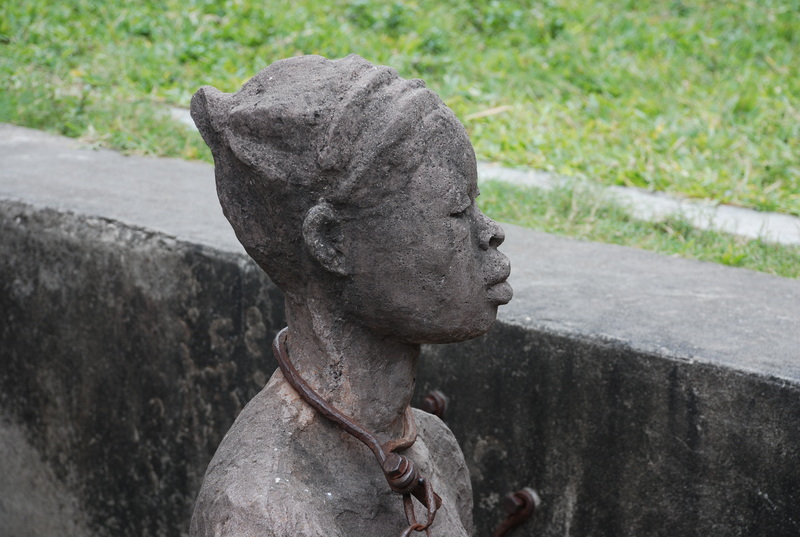 How has the ECHR defined its role when dealing with cases which concerned large scale historical injustices? The workshop will provide a forum for reflection on these issues which are of great importance for the maintenance of peace and stability in Europeand beyond. The way that the European system of human rights protection will deal with these situations is likely to have repercussions on a global scale. The fourth Global Humanitarianism Research Academy (GHRA) took place from July 09 to 20, 2018 at the University of Exeter and the Archives of International Committee of the Red Cross in Geneva. The GHRA was organized by FABIAN KLOSE (Leibniz Institute of European History Mainz), JOHANNES PAULMANN (Leibniz Institute of European History Mainz), and ANDREW THOMPSON (University of Exeter) in cooperation with the International Committee of the Red Cross and with support by the German Historical Institute London. The Steering Committee received a huge amount of applications for the GHRA 2018 from around the world and selected twelve fellows (nine PhD candidates, three Postdocs). The participants came from Canada, China, France, Germany, Norway, Switzerland, the United Kingdom, and the United States and represented a range of disciplinary approaches from History, International Relations, and Political Science. 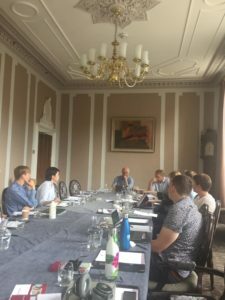 Additionally, the GHRA was joined by GUY THOMAS (ICRC Geneva), IRÈNE HERRMANN (University of Geneva), STACEY HYND (University of Exeter), MARC-WILLIAM PALEN (University of Exeter), and ANDREAS GESTRICH (German Historical Institute London). On Day One, the participants started with discussing crucial texts on the historiography of humanitarianism and human rights. The common reading list included texts regarding the historical emergence of humanitarianism since the eighteenth century and the troubled relationship between humanitarianism, human rights, and international humanitarian law. Furthermore, the participants reflected on twentieth century conjunctures of humanitarian aid and the colonial entanglements of human rights as well as recent scholarship on the genealogies of the politics of humanitarian protection and human rights since the 1970s. 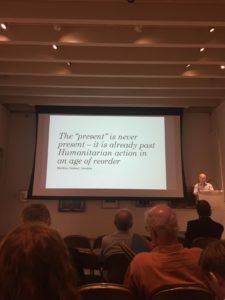 In the evening, MARCUS GEISSER (ICRC, United Kingdom) gave a stimulating public guest lecture “The ‘present’ is never present – it is already past. Humanitarian action in an age of reorder” at the Royal Albert Memorial Museum Exeter, in which he reflected on his personal experiences as an ICRC delegate for twenty years in various conflicts around the world.